A Mediterranean rainfall pattern has the wettest winter month with 3x the driest summer month. Portsmouth misses out on being Mediterranean by 4mm. Even if it did fit within the threshold, I'm not sure I would regard it as Mediterranean. Med summers get high summer sunshine due to extended high pressure suppressing convection and frontal activity. Portsmouth gets comparatively cloudy summers, so that would suggest that the suppressive effect isn't happening to any great degree.. I'd say it's similar to many Oceanic climates, that see increased high pressure, but not enough to keep fronts away or suppress convection. My climate also sees a large decrease in the rainfall total from winter to summer, but has it's cloudiest month in summer -definitely not a Mediterranean trait. Last edited by Joe90; 11-27-2014 at 06:59 PM..
Yep, I guess it's all relative. There's definitely a big shift to a Med type pattern in that area. Is it from high pressure dominating for extended periods, or just local geography giving Portsmouth a moderately sunny summer, in a region of cloudy-ish summers? As climate is on a spectrum, climates in one group will steadily transition to other climates. I'm trying to figure out where Portsmouth is on that transition. It's summer influence could actually be more Med than Oceanic. I don't really know, because I don't have an understanding of the weather patterns during summer there. There are some good TV programs showing UK coastal areas. Looks like a lot to see. Portsmouth looks much cloudier than any usual Mediterranean climate in the winter, long lasting bouts of high pressure must be rather rare. New England tends to be sunniest along the coast as well. Not sure why. An interesting contrast to here, where coastal areas are greener and inland areas are drier looking. Nice photo. 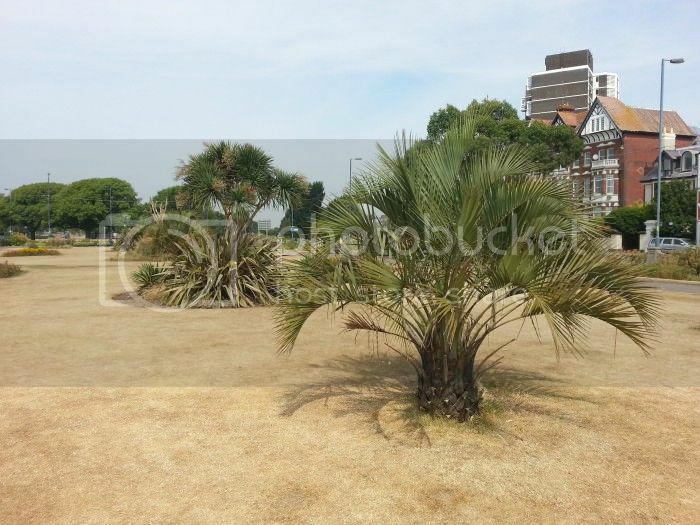 The wine palm doesn't have the blue tinge, even with the dry conditions. We're getting our cloudiest weather now, as convection is at it's most active, so towering cumulus is an almost daily event, which often extends cloud cover out over the coast. January and feb are the sunniest months at about 62%, due to longer lasting high pressure reducing convection a bit. 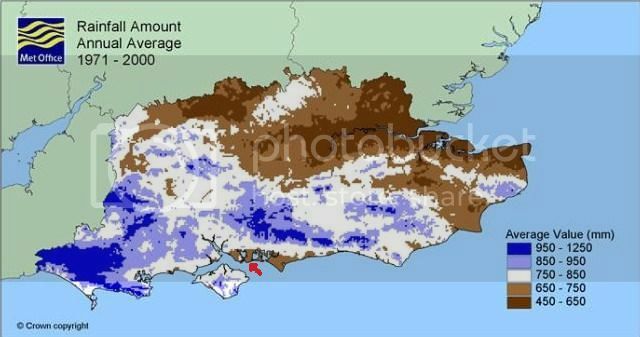 Fronts are less frequent, but the 5 days of rain a month, will still bring 80-100mm on average. 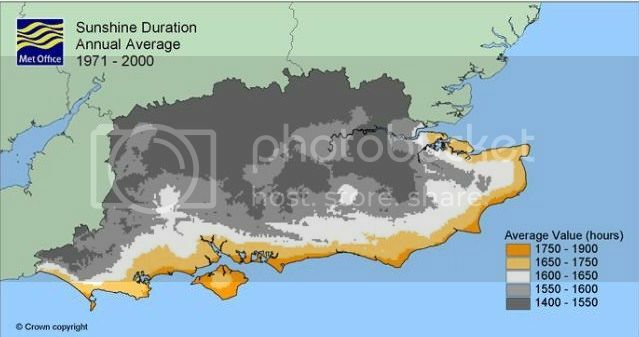 Did the warmest/sunniest areas of the south coast have a distinct vegetation type from other parts of Southern England?